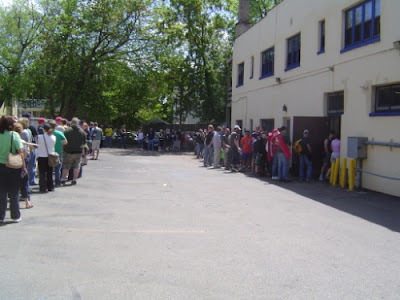 This is where it all starts: People waiting in line (in this case, at Star Liquor on Willy Street) to buy their tickets to The Great Taste of the Midwest, which is quickly becoming the biggest celebration of craft beer in the nation, to say nothing of it being the most sought-after ticket in town. Last year we got tickets by mail. They have a lottery every year, but the odds aren’t very good: There are only one-thousand tickets available, you must send your check in on one particular date, and about a gojillion people write in. We were flat-out amazed when our check was cashed and still flat-out amazed when the tickets arrived in our mailbox a week later. The two years before that, we got our tickets through the generosity of a guy My Darling B works with. He always bought four tickets, because they let you do that back then (you can only buy two apiece now) and because he figured he would run into somebody who would like to go as much as he did. And lucky us, he asked B if she wanted a couple tickets after it turned out all his other buddies had something else going on that weekend. How do you forget the biggest beer festival is going on and plan something else that weekend? It’s beyond me, but I can’t say I spend a whole lot of time wondering about it. This year, we didn’t want to impose on anybody and we didn’t want to rely on being lucky enough to win the lottery two years in a row. 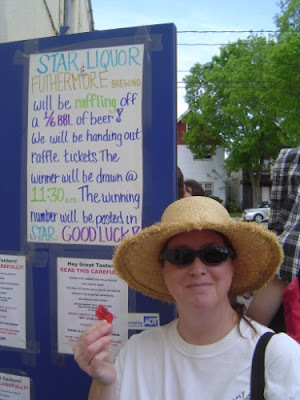 And last year, our friends at Star Liquor said that everyone who got in line for tickets went home happy. Some of them were so dedicated, they got in line at five o’clock in the morning. We weren’t as gung-ho as that. We jump in the car and head over didn’t head over there until nine and got into line at maybe nine-fifteen. By then, the line stretched around the corner, down the street, around the next corner and halfway down the back side of the block. A couple of guys from The Madison Homebrewers and Tasters Guild were selling the tickets, and they had just six hundred to sell at Star. You could get tickets and two or three other liquor stores in town, but Star Liquor had more than anybody else. And they’re our buddies. We wouldn’t shop for our liquor anywhere else. *schmooze, schmooze* When B and I got in line we were handed slips of paper with “264” and “265” on them, guaranteeing us a couple tickets each, so we got there just in the nick of time, although next year we’ll probably have to leave the house at eight o’clock if we want to get tickets. Even though they were handing out numbers, at least one of us still had to stand in line. They strongly suggested it would be bad form for us to leave our lawn chairs to hold our spots while we went to breakfast, shopped for groceries, went home to get a nap and then came back, but we’d planned to stand in line all morning, anyway. I had a couple books in my backpack, and B had plenty of reading material to help her while away the hours, too. To make the morning even better, B won the raffle for a 1/6 barrel of Furthermore beer! That’s really good beer, in case you’ve never had any. And she didn’t even have to buy the ticket! They were handing them out free to everyone as a way of saying, ‘thanks for waiting in line all morning!’ Then, at around eleven-thirty, a great cheer arose from the direction of the liquor store as the winning ticket was drawn, and shortly thereafter one of the guys from the store came walking down the line holding up a sign with the winning raffle ticket number magic-markered on it. “That’s because it’s my number!” My Darling B said, and held her ticket up in the air. Here’s the lucky girl with her winning ticket. We’ll let you know when we pick out the date for the patio party at Our Humble O’Bode! Next stop: The Great Taste of the Midwest!